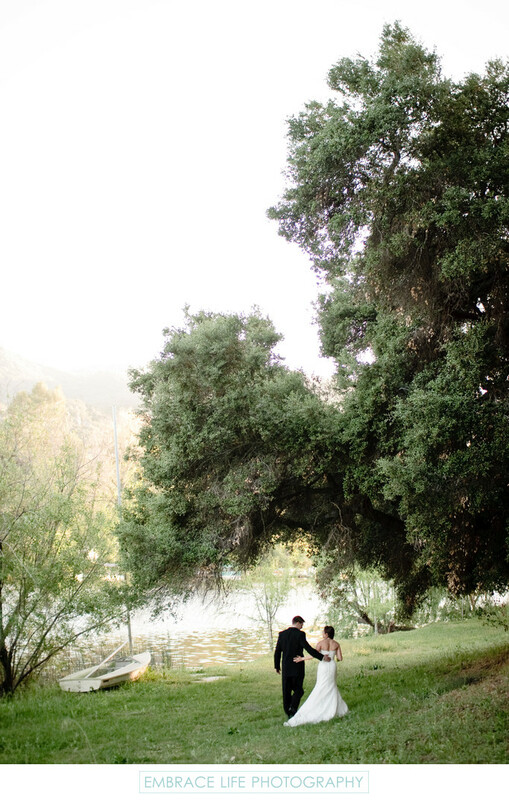 Newlywed couple walks under a spectacular oak tree near the a rowboat on the shore of the Malibou Lake on their wedding day. The unique wedding venue, Malibou Lake Mountain Club is just a couple of miles off of the busy 101 freeway in Agoura Hills, California, a Los Angeles suburb in the Santa Monica Mountains near Malibu, but when you're there, you feel far removed from anything urban and more like you're at a mountain retreat. Location: 29033 Lake Vista Drive, Agoura Hills, CA 91301.